EDIT: I was scooped! It's on the mainpage. An article was published in Nature today that unfortunately lies beyond a paywall, but it describes a study that was conducted by a group of researches studying penguins. 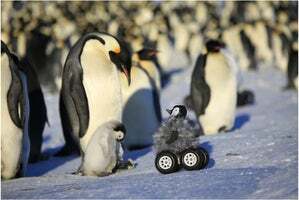 It seems to show that the use of rovers carrying equipment camouflaged by a penguin chick disguise significantly reduced the number and degree of stress responses exhibited by the penguins. The study measured stress indicators of the penguins, such as heart rate, and compared them to the numbers observed during human researcher interactions versus the numbers observed during rover interactions, and found that the level of disturbance among the penguins was much lower with the disguised rover. In fact, some penguin chicks attempted to huddle with the rover. The use of the rover also interferes much less with the structure of the colony, thus reducing scientific bias that is an inherent by-product of human interactions.